You can sort the table by domain name, number of links to a domain, number of posts or number of authors that link to a domain. From this table you can nofollow or strip all links to a domain, or multiple domains. Check either the Nofollow or Strip checkbox in each domain’s row and click the Update button, below the table. Clicking numbers in “Links” or “Authors” columns will generate a report that shows all links to a domain or all authors that link to certain domain, respectively. You can also nofollow or strip a link(s) or multiple links from this report. 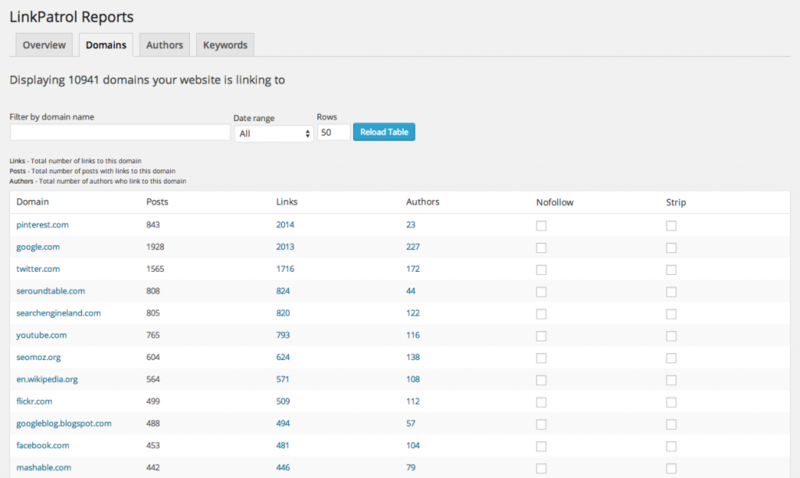 This report allows you to see all authors who link to a certain domain. For each author you can see total number of posts with links to current domain, as well as total number of links to domain. Clicking a number in links column will generate a new report (Domain > Author > Links) that lets you see all links to current domain, added by current author. This report allows you to see all links to a particular domain added by an author.